If you've ever been to Graceland, you've undoubtedly seen the "TV room" with its three televisions built into the wall. Back in the 60s you had to be the King of Rock n' Roll to have such a groovy setup. Now you can buy everything you need to do this while shopping for groceries at the local discount warehouse. Not only that, your wall-hung TV can do something Elvis' never could: It can move. Hanging a flat screen TV really is no big deal, but before you get lost in dreams of kicking back on your overstuffed sectional to catch some Bonanza reruns, there are a few important considerations to making sure you get the installation right. The big "hanger" that actually mounts your set to the wall is a TV mounting bracket. These can range from $50 to upwards of $250, but you absolutely have to have one. Don't try to hang your TV with anything else. There are three basic types of TV mounting brackets: flush-mount, tilting, and full-motion. Flush-mount tends to be the slimmest and can get your TV within 1/2 inch or so of the wall. However, they don't allow for any movement. Tilting brackets let you tilt the TV down a limited amount; they don't tilt upward from 90 degrees. This is an ok option if you watch from both seated and standing positions (or from another room) and don't need side-to-side movement. Full-motion brackets tilt down as well as rotate from side to side-some up to 90 degrees. They also pull out from the wall, which is required for side rotation. When choosing a bracket, make sure it's compatible with your TV and meets its weight requirements. Features you'll pay extra for include mobility (titling angles and rotation capability), depth of mount (how far the bracket sticks out from the wall), continuous adjustment (some tilt models have just a few preset positions; others are infinitely adjustable within the tilt range) and, of course, general quality. Some full-motion brackets have bodies that recess into the wall cavity. The bracket arms collapse into the body so the TV can be pushed nearly flush to the wall. Make sure any bracket has some voids within its framework for running cables straight back from the TV into the wall, or for adding a wall receptacle or connection box. LCD screens have gotten a lot better over the years regarding viewing angle, but they still look best when viewed straight on. That means your viewing position should dictate where the TV goes (if the best spot isn't good Feng Shui, you'll have to take that up with your spiritual advisor). Most people prefer to watch TV at eye level so that the middle or upper third of the screen is level with your eyeballs when you're in your favorite chair. A set that's too low can feel like a back-row seat at a multiplex theater, while having it too high is like watching TV at an airport. The right mounting bracket makes the all-important placement question a lot easier to answer. And there's one more thing on location: You have to mount the bracket into two wall studs, or at least one stud and heavy-duty hollow-wall anchors (like toggle bolts), which is recommended for small TVs only. Use a stud finder or a nail and hammer to find and mark the studs before settling on a final mounting location. I wouldn't dare attempt to advise anyone on the latest equipment for TV connectivity and controls. There are plenty of better sources for that, such as cnet.com or a good sales staffer at a home electronics store or an electrician. But no matter what you use for hookups, you'll have to run some cables. At the very least, the TV will need a power cord and a connecting cable from an A/V receiver or an HDMI switcher. Huh? Don't worry; you'll sort that out at the electronics store. For now, all you need to know is that a receiver or switcher allows you to plug multiple devices (DVR, cable/satellite box, audio equipment, gaming console, etc.) into one "box," then run a single HDMI cable (which carries both picture and sound) to the TV. This makes it easier to install the TV and hide the cables, and it solves the common problem of having more devices than inputs for them on the TV. When wall-mounting a flat screen, you simply have to hide the cables; plastic cords running down the wall is bad tech Shui. The cleanest installation is to run the cables into a special receptacle box installed within the footprint of the TV's mounting bracket. The cables snake down the wall cavity and come out at another receptacle located behind the furniture housing your other A/V equipment. Alternatively, you can install a regular electrical receptacle behind the TV and run just the A/V or HDMI cable down the wall. It's against the building code in most areas to run a TV's power cord inside a wall. The other option is to hide the cables inside a cable raceway, an enclosed plastic track that mounts to the wall surface. This installation is easy, and you can paint the track to match your wall color. If you don't own your home, a raceway is the way to go. Flat screen TVs allow for installation options that Graceland's remodelers never could have dreamed of, but just because you can mount your TV almost anywhere doesn't mean you should. Keep in mind that a TV is for watching, not for fitting into a decorating scheme. Take the time to test-drive different viewing positions to make sure the placement provides a good, comfortable view as well as versatility for multiple viewing situations. 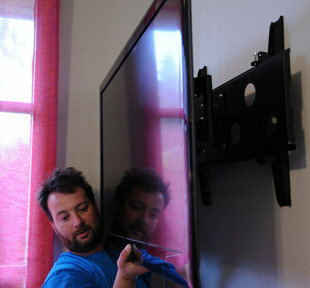 Mounting a TV requires at least three people-two to hold the TV against the wall and one to watch, literally.